New details have emerged in the tragic case of Andrew Wordes, who died recently in his home after enduring more than four years of abuse and bullying from the City of Roswell in Georgia. Thanks to continued investigation of the case by Maggie West Bean ofExaminer.com, it is now coming to light that Roswell officials may have put immense pressure on Mr. Wordes’ original mortgage holder to sell the mortgage note on his home, only to have it end up in the possession of a phony trust company that appears to not even exist. In case you missed the original story, Andrew Wordes had been quietly and legally raising chickens in the backyard of his home at 335 Alpine Drive in Roswell when the City of Roswell decided to pursue and destroy him. 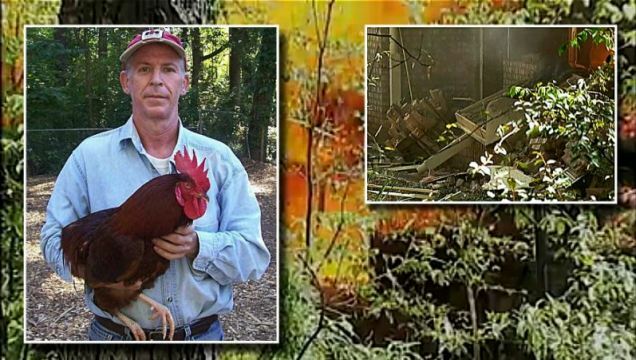 After years of relentless harassment, torment, and threats, Mr. Wordes ended up dying in his home after it exploded on the day when county marshals came to forcibly evict him (http://www.naturalnews.com/035524_Andrew_Wordes_Roswell_chickens.html). But it turns out that the entire eviction process was fraudulent to begin with, which is what was speculated by many all along. According to information recently uncovered by journalist Maggie West Bean, Dora Hardeman, the friend and landlord of Mr. Wordes who had long held the mortgage to his home, was basically pressured to sell her house to a man named Arnold Wall, who appears to have been used by the City of Roswell to get the note by any means possible. Exhausted from dealing with the “increasingly unpleasant situation” that was quickly developing between Mr. Wordes and the City of Roswell over the property, Mrs. Hardeman reluctantly agreed to hand over the mortgage note to Mr. Wall, who happened to be the husband of a realtor with whom she was acquainted, in February 2011. In return, Mr. Wall gave her a note for $40,000 that stipulated a payment would only be made after Mr. Wordes “quit the premises,” or after a year had passed, whichever came first. But more than a year has now passed, and Mrs. Hardeman has yet to receive a dime from Mr. Wall for the property. And a followup investigation into the bill of sale for the property has revealed that an “Equity Trust Company,” not Mr. Wall, was the actual buyer of the property. And on the note, there are no values given for the actual value of, fair market value of, amount of liens owed on, net taxable value of, or tax due on the property, which points to clear fraud. Worse, the address listed for “Equity Trust Company” has been exposed as being the address of a UPS Store in Tucker, Georgia. So not only does the new mortgage holder appear to be fake, but it appears as though the City of Roswell may have used Mr. Wall to pretend to purchase Mr. Wordes’ property, only to have it handed over to a fictitious equity company so the City of Roswell could forcibly drive Mr. Wordes out of his house. From the very beginning, the City of Roswell’s Code Enforcement division violated the law by contacting Mr. Wordes’ original mortgage holder and setting in motion the events that would lead to his eviction. And newly surfaced emails reveal that the “investigation” into the City of Roswell’s criminal activity was being led by the City of Roswell. An email exchange between Mr. Wordes and City Administrator Kay Love (http://www.roswellgov.com/index.aspx?NID=75) from early December 2010 exposes the City of Roswell’s obvious coverup of the truth in the mortgage scandal, as Ms. Love explains to Mr. Wordes that she will personally be heading up the so-called investigation, and that Mr. Wordes will not be allowed to bring a witness to a meeting where he is to give a statement about the ordeal.